Since payment facilitation is still an emerging concept in the payments world, and many software providers are either looking to enhance their integrated offering(s) or launch one that will represent a significant value proposition for its downstream clients, we thought it made sense to offer some input in an effort to help simplify what all the jargon means. Let’s walk through an overview and then cover some industry terms and definitions. As a Payfac in a Box™ (“PFIB”) software partner, you are never in possession (ownership) of your merchant’s funds, which could be potentially problematic and create unwanted risks and exposure that could be detrimental to the viability of your business. Leveraging the PFIB library of API’s, every transaction/authorization request is always executed in a PCI compliant, and fully-secured environment, removing you from any further risk or liability related to fraud or funds flow since you are leveraging our platform to perform the processing and settlement. In our PFIB model you, the software company, would become the ‘Master Merchant’ and as a result, in a position to simply onboard the downstream users of your platform (referred to as “sub-merchants”) as if you were a registered payment facilitator. Each of your clients agrees to the pricing and terms associated with your master merchant agreement, which allows for transaction processing activity to occur inside their own separate flow of funds. This structure protects everyone – you, the sub-merchants, and their customers. When you as the software partner become a master merchant and processing is thereafter approved for all businesses operating within an approved Merchant Category Code (MCC), each downstream client can establish a sub-merchant account very quickly and effectively through the use of our automated batch boarding tool or using a simple enrollment tool very similar to what you might have seen or used before if you have set-up an account with Square. This process offers a dramatic improvement in the amount of time and complexity typically required with setting up a new merchant account, increasing adoption rates by leaps and bounds over the more traditional “gateway integrations” that software companies have been doing for many years. When a software company starts looking for a processing provider to partner with, there are several important considerations including contract terms (length and revenue share), customer service and support for the sub-merchants, simplicity and coding language options of the API documentation, platform functionality (convenience fee, Card present/EMV device support, security and PCI scope, settlements/disbursements (we can do split settlements- learn more), reporting functionality, and more! Here are some important terms you’re going to hear during these conversations. Buyer/Consumer – The buyer is the cardholder who is the customer of the sub-merchant where business is being transacted. This person permits their (issuing) bank to send money to the merchant/seller’s acquiring bank by purchasing a good or service with a credit card through the software solution. Such as a patient in a doctor’s office paying their co-pay through that office’s practice management system. Merchant/Seller= Sub-Merchant – The intended recipient of the cardholder’s money is the sub-merchant in the payment facilitation model. This business owner or merchant is an active user of a software platform and accepts payments from the cardholder through that platform. Platform – A web business or SaaS solution that connects customers (buyers) and users (sellers). Payment Facilitator – An entity that takes legal responsibility for funds disbursement and settlement in the process of directing them from buyers to sellers. Payment Gateway – A secure channel that moves data between payment facilitators and higher-level financial institutions like banks or card networks. They provide APIs for a payment facilitator to interact with to securely transfer the data. Acquirer – A bank that underwrites the payment facilitator. The acquirer may store funds kept within that payment facilitator’s accounts. It also (similar to a payment gateway) connects the payment facilitator to higher-level financial institutions with APIs. Card Association – A private network that facilitates transactions and settlement between issuing and acquiring banks of the parties involved in a transaction. There are four major card associations in the US: Visa, Mastercard, AmEx and Discover. 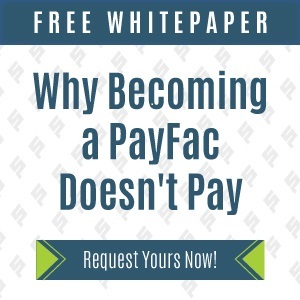 Ready to learn more about how a PayFac partnership could be the right fit for your software solution? Request a free consultation today and let us talk through all the benefits of payment facilitation partnership for your software solution.